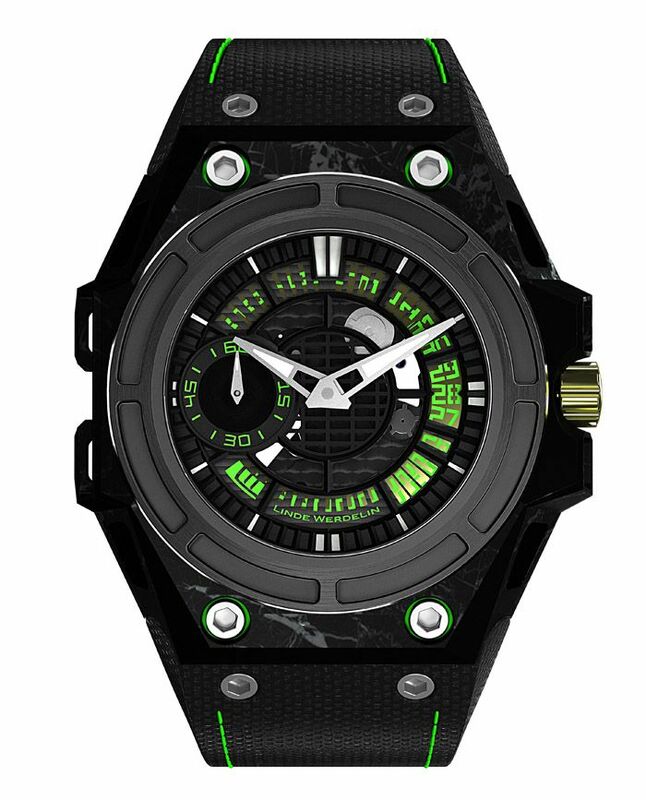 Our friends from Linde Werdelin already introduced their Baselworld release for this year, the SpidoLite II Tech collection. The SpidoLite II Tech is based on the regular SpidoLite II but this time manufactured out of new materials. This has been done to make the SpidoLite II Tech even lighter and stronger than its previous versions. As you probably know by now, the Linde Werdelin watch cases are a technical piece of art. The construction consists of an inner case and an outer case, which we explained in the past (click here for our hands-on SpidoLite II review). The inner case has been made out of ALW while the outer case has been made out of carbon. 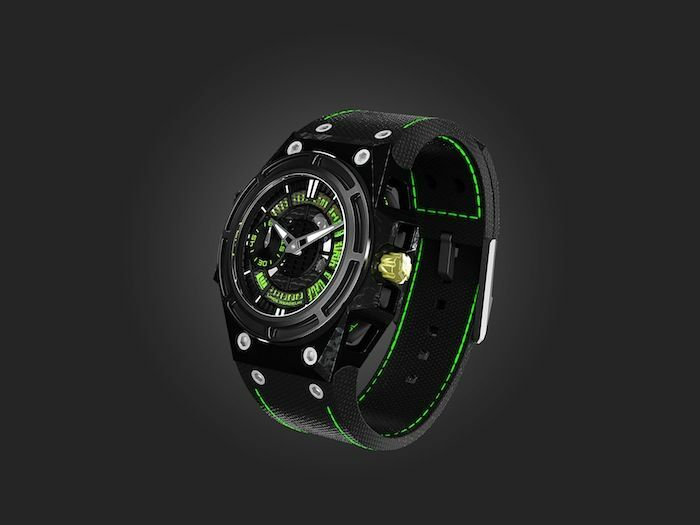 The SpidoLite II Tech Green has a bezel made out of ceramic. ALW stands for Alloy Linde Werdelin and is made out of this metal alloy/composite that has originally been developed for the aerospace industry. The skeletonised SpidoLite II has the optimum balance between lightness and strength, a process that has cost the developers at Linde Werdelin two years. Linde Werdelin has always used very interesting movements, from vintage A.Schild movements with a slight twist (for example the Spidospeed SA) to these movements of Concepto that Linde Werdelin also used for their SpidoSpeed Chronograph models (click here for our SpidoSpeed review). 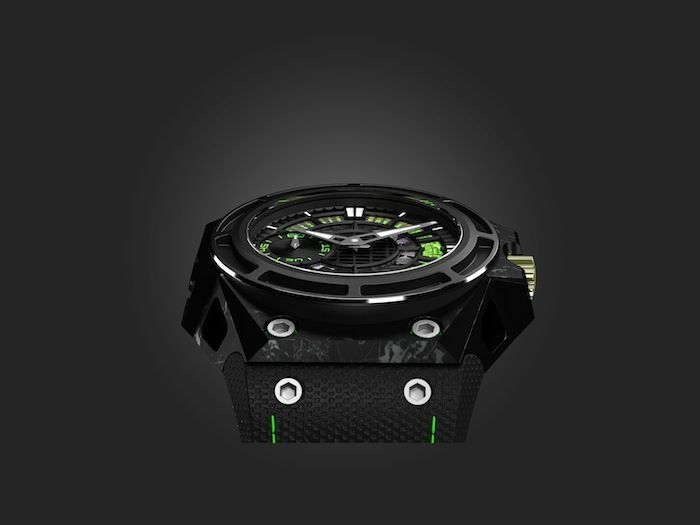 In this SpidoLite II Tech models, Linde Werdelin used their caliber LW04 movements, based on a movement by Concepto. This movement manufacturer is an independent party and operates from La Chaux-de-Fonds in Switzerland. The LW04 movement can be observed through the skeletonised dial as well as via the transparent caseback. In the early days of Linde Werdelin, which is still quite recent in horological terms, the watches were all limited to a number of 22 or 88. In the past years, this has changed and we’ve seen limited pieces of 100 pieces and now of 75 pieces for the SpidoLite II Tech models. There are two versions of the SpidoLite II Tech, the Green and the Gold, limited to 75 pieces each. The SpidoLite II Tech Green comes on a beautiful calf strap with matching green stitching and the SpidoLite II Tech Gold comes on a calf strap with red stitching. The Green has a list price of 13.000 CHF (excluding VAT) and the Gold has a price tag of 17.500,60 CHF (excluding VAT). The latter model uses a red gold bezel and a gold crown. More information can be found on the official Linde Werdelin website. As soon as we can get our hands on one of these pieces in Basel at the end of this month, you will find the best pictures here of course, shot by our watch photographer Bert Buijsrogge.